Blog | Why Is Silence So Devastating? 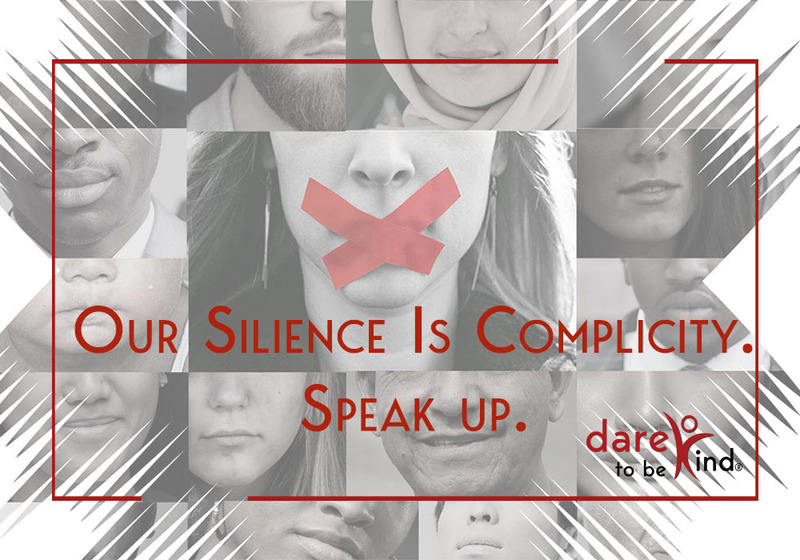 When I say, “our silence is complicity,” it is laden with many emotions. Let’s be honest. All of us have been complicit at some time or another, and that is why we agree and bob our heads in acknowledgement of our silence. Today, though, I would like to explain why it is so explosive on an emotional level for many of us and why we agree but feel powerless to change our silence. (b) that you can do little to nothing about it. Whatever choice you make, however, you know that in both cases you have been complicit. Therefore, this word “complicity” has an emotional charge. And sadly, we are incapable of measuring the devastating impact our complicit actions have on others. We all are at the same starting block. We all have been complicit in some area. But how and what can we do in the future to turn our silence into a voice that can and will BE the difference for someone else or even yourself? How do we do this? Think back to a moment when someone stood up for you. Think about how that felt. I was flying back from Tokyo to Brussels. European airports have two lines at arrival, one for EU passport holders and the second for foreigners. It was extremely busy at the airport that day. Security personnel were guiding the passengers to the right line-ups. One of them came up to me, and without asking to see my passport, told me I was in the wrong line. I politely told him I had an EU passport. He told me it did not matter, and I should go to the other line. This repeated itself several times. In the foreign line-up, they sent me straight back to the EU line. Finally, after going back and forth for 30 minutes, I saw a tall, dark-skinned man in the EU line. I positioned myself so close to him that he looked down and asked if I was okay. I told him kindly that his skin color was many shades darker than mine and I was curious if he’d make it through. He burst into laughter and told me to stick with him. I thanked him and told him he would not be able to pass, but that it would be fun seeing it all unfold. “We will see about that, won’t we?” he said. Finally, our turn came. Exactly as I had predicted, they looked at him with disdain and told him to go to the line for foreigners. In a dry tone, he pointed out that his passport was French and that he was a French citizen and a member of the EU. He asked to speak to the supervisor and did not budge. The supervisor arrived and asked what the trouble was. The man answered in a dignified manner that he was a colonel of the French army and showed his army credentials. Now, walking away at this point would have been the easiest thing for him to do. Why should he help a stranger? But he took that one moment, and, instead of staying a bystander, he became an Active Witness. What an experience, to have someone speak up for me. Never have I forgotten this moment when a stranger refused to let silence win. This total stranger decided to not only speak up for himself but also help me at the same time. By him speaking up for me, he indirectly gave me a voice. I suddenly mattered and out of this experience I felt more confident with each step I took as I had just witnessed the courage of speaking up. There are many times in my life where I know of moments nobody spoke up to help, where the group stayed silent, not because they were mean or unkind, but because they, too, were scared. They, too, struggle with their voice, and they, too, hope someone else will “speak up” for them. From my early, painful childhood experiences of being bullied due to the color of my skin, I was forced to dare and find my might. But this is why I bring up the devastating effects of silence. Having interviewed many people, I know that during that crucial moment, the natural reaction is to feel embarrassed and hope against hope that someone will stand by us and take away the silence… But often the moment passes without any of us using our voices to be heard. And before we know it, our silence becomes an unconscious part of our everyday life. So the #DaretobeKind Movement is about reminding us that all it takes is one person daring to speak up and be that beacon of hope! This is all it takes to sever the deafening silence!